A fantastic seven day holiday following the route Garibaldi and his thousand men took from Corleone in their conquest of Palermo. With more than 20 hours on horseback, amid plains and hills in Mediterranean countryside, you move from old Sicilian peasant tracks to the streets of Palermo. A historic, cultural and scenic journey which will prove an unforgettable experience. Welcome. Introduction of staff and itinerary. Visit the farm holding with its grass-fed horse breeding. Visit the nearby medieval town of Palazzo Adriano. Breakfast. Departure for Corleone, crossing Lake Raia behind the village of Prizzi and continuing through a landscape of hills and plains. We ride along ancient pathways that cross “Contrada Imbriaca” where the land and property belong to the historic Orlando family. Here there is a large panoramic valley which extends towards the small town of Vicari. Launch. he trek continues to a farm bed and breakfast located between Campofiorito and Corleone. There is a guided tour of Corleone and its historic quarter. You find out about the “diversivo di Corleone” Garibaldi’s solution to surprise the Bourbon troops in his conquest of Palermo. Visit C.I.D.M.A. museum, international mafia and anti-mafia centre. Breakfast. Departure for Bosco della Ficuzza national park. Riding along the valley below Corleone we move to the west of Rocca Busambra (1613) the highest point of the Sicani mountain range as well as in western Sicily. Lunch in the national park. We continue and in the early afternoon arrive at the Royal palace and its surrounding buildings situated in the heart of the wood. The Bourbon Royal Palace was built in the early 1800s for King Ferdinand IV when he went hunting. Guided tour. We get back into the saddle and soon arrive at the historic mountain refuge Alpecucco. Time to rest,Dinner and overnight stay. Breakfast,, and on the move again this time towards the town of Piana degli Albanesi. Leaving the national park we go past Lake Scanzano and cross valleys and mountains around the small town of Marineo, which Garibaldi and his troops went through en-route to Palermo. Packed lunch amid fields and trees in open countryside. An opportunity to relax.We set off again towards the Lake of Piano degli Albanesi at the entrance to the town of St Cristina Gela and then move on to Piana degli Albanesi, one of five towns in the Province of Palermo having Albanian origins. Arrival at farmhouse bed and breakfast. Dinner, brief tour of the town to discover its historical, cultural wine and culinary traditions. Breakfast, Continuation along Garibaldi’s route. We arrive at the highest point in the area, the Passo del Garrone, located at the centre of Serre della Pizzuta national park. We go along rough, unpenetrable paths once home to the bandit Giuliano and his followers, passing places like Portella della Ginestra, today a place of commemoration in the history of Sicilian workers after the massacre attributed to Giuliano. Packed Lunch in the area of “Cannavera”. We resume our journey towards the wood of Casaboli, near Pioppo and Monreale. We go through the places which formed part of the strategic plan to seize Palermo by Garibaldi and his “piciotti”. Moving on to San Martino delle Scale we see the medieval building of Castellaccio, today run by the Italian ramblers’ organisation (CAI) as well as the Benedictine Monastery. Starting the descent towards southern Palermo there is the wonderful view of the city and the Conca d’Oro, before arriving at Baida. Transfer to Bed and Breakfast in the inner city of Palermo Dinner and overnight stay. Breakfast, transfer in minibus and guided visit to the Old Town in Palermo. Walking tour to places regarding the history of the Thousand, the arrival of Garibaldi and heroic popular events. 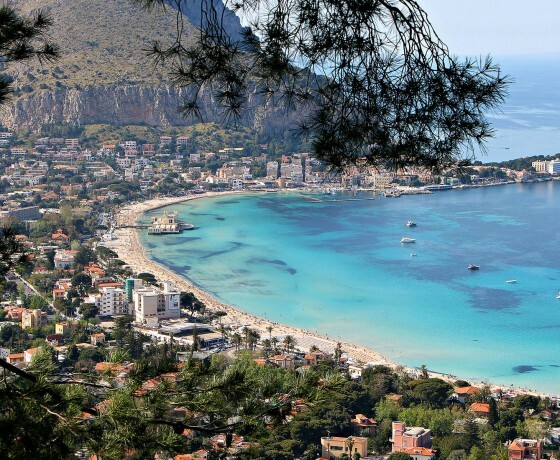 Free afternoon or as an alternative visit the famous sea resort of Mondello.